Update 2: The Rattlers were beaten by Woodlawn, 5-2, Saturday and will play today (Monday, May 11) at 1 p.m. against Springhill to determine the 3rd and 4th place seed in the state tournament, which will start this Thursday at Marked Tree. The Lady Rattlers were also beaten Saturday, 6-1, by Foreman. They will also play Springhill today at 2 p.m. to determine the 3rd and 4th place seed in the state tournament, which starts this week at Norphlet. Update: The Rattlers beat the Hermitage Hermits 10-0 in Regional play and are guaranteed a spot in the state tournament. The Murfreesboro Rattlers entered the South Regional Tournament at Woodlawn High School this week wearing the 7-2A West District crown. The Rattlers defeated the previously unbeaten No. 1 Springhill Bears, 12-2, Saturday night to secure the district championship and also bested their conference rivals, the Dierks Outlaws, in the semifinals, 2-1. The tournament’s Top 4 was rounded out by Springhill (2), Dierks (3) and Gurdon (4) and those teams will advance to the South Regional. The Rattlers earned the district title under Head Coach Marc McRae and longtime volunteer assistant Robbie Crocker. Both coaches are former Rattlers and this year was McRae’s first year heading up the baseball team. 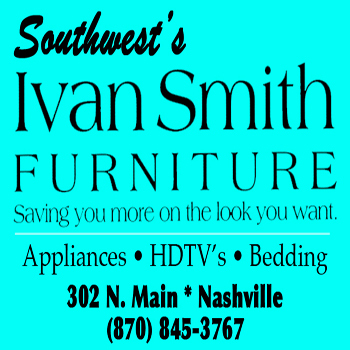 Last week’s tournament was the first time in many years that Murfreesboro has hosted a district tournament – softball or baseball. This year both were held at the Murfreesboro City Park and big crowds turned up for all the games on both fields, despite a rainy start early in the week. After trading 3-up 3-down in the first inning, the Rattlers opened up a 6-0 lead over the Bears in the second frame. Alex Kennedy put the inning in motion with a single up the middle and was later singled home by Logan Wilcher. Adam Bailey drew a walk and Daniel Myers was hit by a pitch to load the bases and freshman J.C. Motley delivered a RBI single to score freshman pinch runner Jack Stuard. A Bear error allowed two more runs to score for a 4-0 lead before designated hitter Tyler Gilbert ripped a single good for 2 RBIs to put the Rattlers up, 6-0. Springhill responded in the second inning by drawing a lead-off walk from Alberto Rivera, who quickly scored when Will Phillips banged a drive off the fence. The Rattlers went in order during their half of the inning. The Rattlers plated another run in the third inning when Motley doubled to left, advanced to third and then scored on an error by the Springhill pitcher. The run put the score at 7-1. After a quiet fourth inning, the Bears picked up their final run of the game in the fifth. Rattler errors at third and second and two errant pitches allowed the run to score. Murfreesboro then put across all they needed in the top of the sixth inning to shut the game down early. Myers singled, Ryan Roberts and Chase Dowdle walked and Jarrett Pitchford doubled two of them home for a 9-2 score. Dowdle soon scored on a blooper from Kennedy and Bailey’s single plated the night’s final two runs and the set the 12-2 final. Wilcher got the win on the mound for the Rattlers. He had 2 strikeouts and 2 walks and gave up 2 runs on 8 hits. The Rattler hitters included Roberts with 1 hit and 2 RBIs, Gilbert with 2 hits and 3 RBIs, Pitchford with 2 hits and 2 RBIs, Kennedy with 3 hits and 1 RBI, Wilcher with 1 hit and 1 RBI, Bailey with 1 hit and 2 RBIs, Myers with 1 hit and Motley with 2 hits and 1 RBI. The Rattlers had 3 errors in the field while the Bears had 4 miscues. As is when Dierks and Murfreesboro meet on any playing surface, the 7-2 West District semifinal game involved an intense battle. The Rattlers prevailed for the second time this season over the Outlaws (11-5 on April 21) and came out on top, 2-1. Dierks’ undoing came by the arm of Rattler left-hander Tyler Gilbert, who had 16 strikeouts, 6 walks and allowed only 4 Outlaw hits. The Outlaws also had 3 costly errors in the field. The Rattlers collected 5 hits. Hitters included Roberts, Bailey, Gilbert, Dowdle and Motley. Roberts and Bailey each picked up a RBI with Bailey’s single to right field in the sixth inning plating the winning run. Murfreesboro committed 1 error in the field. Dierks hitters included Tyler Kesterson with 2, including a solo home run, and Blayn Turner and Trendin McKinney with 1 hit each. The Rattler roster includes: Jarrett Pitchford, Nathan Libranda, Jared Lingo, Daniel Myers, Tyler Cox, J.C. Motley, Jack Stuard, Laramie Beshears, Cesar Ciritelli, Todd Snyder, Dalton Cherry, Ryan Roberts, Adam Bailey, Tyler Gibert, Jacob Jackson, Alex Kennedy, Chase Dowdle, Logan Wilcher, Sutton Balch and Jansen Cowart. Managers are Kelsey Higginbottom, Adison Williams and Hannah Buck. SENIOR NIGHT. 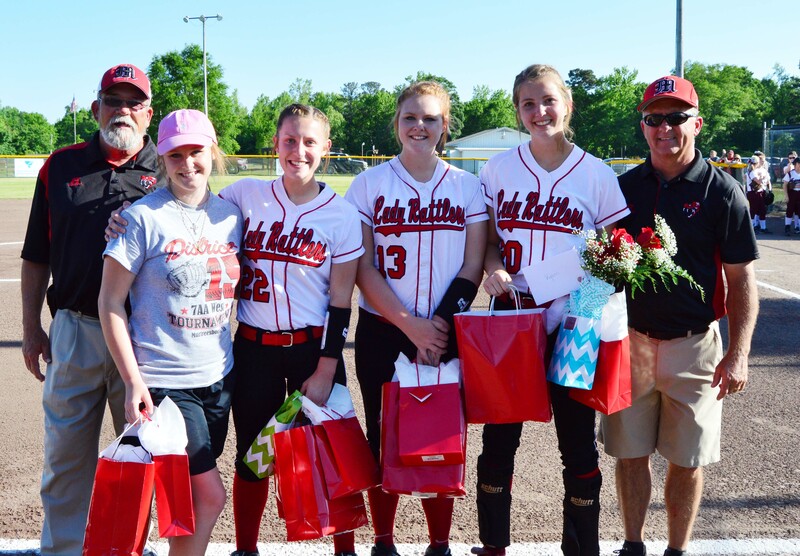 The Murfreesboro Lady Rattlers recognized their four seniors during the district tournament. Pictured are (from left) assistant coach Lonnie Ballard, manager Hanah Kennedy, Olivia Turley, Haley Kennedy, Ryann Grubbs and Head Coach Steve Martin. The Murfreesboro Lady Rattlers’ season will continue this week after they placed third in the 7-2A West District Tournament. Murfreesboro posted a 15-0 win over the Blevins lady Hornets to move on to a match with the Foreman Lady Gators, which Foreman won, 4-2, and then moved on to take home the district trophy. The tournament’s Top 4 was rounded out by Springhill in second place and Dierks in fourth place. It took the Lady Rattlers only four innings to dispatch the Blevins Lady Hornets. Ryann Grubbs picked up the win on the mound, allowing only 3 hits and striking out 8. Grubbs and Sidney Kuykendall led at the plate with 3 hits each, including a triple for each and 3 RBIs each. Morgan Westfall went 2 of 2 with 2 RBIs and Hannah Cox picked up 1 hit and scored 3 times. Megan Cullen added 1 hit and 1 RBI and scored once and Lainy Alexander scored twice. The eventual tournament champions, the Foreman Lady Gators, had their hands full with the Lady Rattlers in the semifinals. Foreman held a 1-0 lead after one inning but Murfreesboro bounced back and cut the lead to 2-1. Murfreesboro plated another run in the third inning, but Lady Rattler errors that same inning resulted in 2 runs crossing the plate and setting the 4-2 final. Grubbs was tagged with the loss but gave up only 5 Foreman hits and 2 earned runs. Murfreesboro collected 7 hits, 2 walks and 2 runs. Krystal Kegley was the winning pitcher for Foreman. Alexander was 2 of 3 with 1 run scored and Kuykendall scored 1 run in the third inning. Grubbs added 1 hit and 1 RBI. The Lady Rattler roster includes: Head Coach Steve Martin, Volunteer Assistant Coach Lonnie Ballard, Anna Corbitt, Kayna Kuykendall, Ryann Grubbs, Haley Kennedy, Morgan Cox, Emily Mauldin, Lucia Aiello, Olivia Turley, Megan Cullen, Jynsen Smith, Lexie Baxter, Ande Terrell, Hannah Cox, Lainy Alexander, Sidney Kuykendall, Loran Wilcher, Morgan Westfall, Katlyne Smith, Morgan White and managers Hanah Kennedy and Kayla Ashbrooks.